Bowmore, Islay’s premier distillery launches its second release of the sell-out Devil’s Casks series. Matured exclusively –and unusually – in first fill sherry casks, the second small batch release of Devil’s Casks is mellower, but still packs a punch. The expression “Devil’s Casks” gets its name from a legend nearly as old as the distillery itself, which commenced in 1779. It was claimed that the Devil was once spotted and chased through the town, eventually hiding away in the distillery. After searching, the Devil was nowhere to be seen, having made his escape in a whisky barrel. At a glance, The Devil’s Casks II ($193) is a deep shade of mahogany and it smells like rich sherry with notes of sultanas, treacle toffee, pecan and maple. The first batch prior to this was much stronger and had an oilier finish whereas The Devil’s Casks II has a layers of sherried chocolate and slightly salty and walnut after-taste. 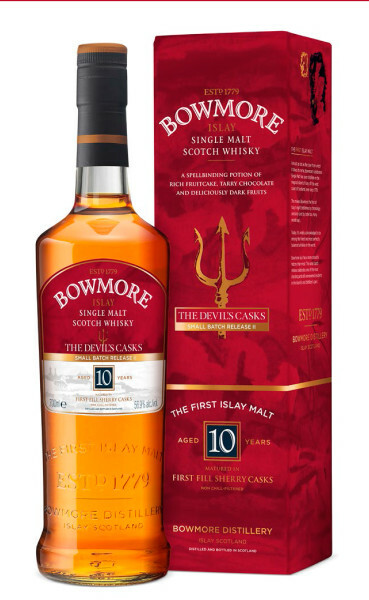 All in all, the second batch of Bowmore Devil’s Casks is easier to sip on should you prefer a lighter tasting whisky. We’re not sure if the devil was in the barrel, but he was definitely in the details for this gloriously layered whisky. Psst, we hear that a part III is in the works! Watch this space.